Light control in cosmetics began with the effects of pigments and fillers used to modify colour perception or skin appearance. We will not return in this contribution on the white powders allowing the make-up, like the famous powder of ceruse (in fact lead carbonate which caused many worries) nor on the telluric loads like talc, kaolin, mica and others treated elsewhere, or on the famous powder of rice of our grandmothers. Theatre has often been a driving force with iconic brands such as Dorin or Bourjois. But as has often been the case, it is with cinema that modern cosmetics has seen its most interesting advances. Most early American silent films were made in black and white, using a blue-sensitive or orthochromatic film as the film. These films were insensitive to red light, which meant that in black and white works, the reds were black and the natural skin looked dark on the screen. The application of film make-up was problematic and many early actors used blue, green and/or bright yellow make-up to achieve an appropriate result, or all white to lighten the skin. Things must have looked very strange on the first films! The panchromatic film partly solved this question. As its name suggests, this film is sensitive to the whole visible spectrum, and as a result, black and white films had more faithful colors than blue or orthochromatic tones. Experiments with panchromatic films took place as early as 1913 in the United States. They were used in some American films as early as 1918. Although panchromatic film has a wider spectrum sensitivity than blue or orthochromatic sensitive film, its use was limited by the fact that it was less stable, slower and more expensive. In 1923, Eastman Kodak began commercial production of a new, more stable, faster and panchromatic medium. The transition to Hollywood from orthochromatic sensitive films to panchromatic films has been very rapid. In addition to reducing its price, Eastman Kodak actively began promoting a new film, highlighting its ability to more accurately render close-up skin tones and produce better images of landscapes and skies in outdoor scenes. Du Pont's release of his panchromatic film on the American market in 1928 and Eastman Kodak's introduction of Ciné Panchromatic Type II film in the same year also accelerated this process. By the time Eastman Kodak presented his film Ciné Panchromatique Super-Sensitive in 1931, the conversion was largely complete. Although panchromatic film could record light over the entire visible spectrum, it was more sensitive to blue than to red, unlike incandescent lamps which emitted more in blue. This required make-up that balanced colours and produced a monochrome image that seemed natural to the human eye. Max Factor was very involved in this work. She sent make-up artist Edward Kaufman to participate in the"Mazda tests", named after the lamps of the time. During the four months of testing, the company successfully developed panchromatic make-up that took into account the differences between the color sensitivity of the panchromatic film and the human eye, as well as the spectral characteristic of incandescent lamps. Max Factor, very involved in this research, tried to keep the new panchromatic make-up as natural as possible. It has developed a series of specific"product" responses to these referenced questions. They were often made from what is called"greasepaint", a make-up product made of fat and powder. These products were developed in the mid-19th century in the world of theatre, in particular by Leichner, a great name in theatre make-up, already as a response to light sources that had become more powerful. Despite its excellent qualities, such as its ability to mask skin defects in close-ups,"greasepaint" showed major defects when it came to colour film. Moreover, the response was essentially colorimetric. In fact, it was Technicolor and the problems it posed that led to the birth of a large family of cosmetics, pancakes. Technicolor is a series of colour film processes initiated by Technicolor Motion Picture Corporation, founded by Herbert Kalmus, Daniel F. Comstock and W. B. Westcott in 1914. Initially used in 1916, Technicolor's evolution was uneven, and it wasn't until Technicolor Process 3 was developed in the late 1920s that it began to gain ground in Hollywood studios. Although a number of films were made using this new process during the Great Depression (1929 and later), Hollywood studios reduced their production until 1932, when a new tri-chromic camera (called a three-band camera or Technicolor Process 4) was developed. The Technicolor trichrome camera is loaded with three black and white negatives which are driven in perfect synchronism by the same mechanism, one being sensitive to red, the other to green and the last to blue. This camera simultaneously exposed the three strips to record red, green and blue light on three separate negatives. These were then combined to produce a colour projection print. 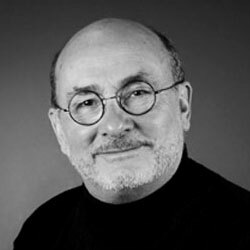 With the introduction of this technique, many problems had to be solved. One of them was makeup. When Technicolor began to be widely used by studios, brighter lighting was needed to get enough light, as well as green and blue negatives. As a result, in brighter lights, the light layer of fat left on the skin shone, revealing colors and reliefs due to the environment, or nearby colors on the plateau. The make-up specialists of the time then sought solutions from specialists. In 1935, Elisabeth Arden bought DeLong and Make-up Studio in Hollywood and used them to create Elizabeth Arden's Screen and Stage division. Nuchromatic make-up, acquired by Arden when DeLong was purchased, has been used in several Technicolor films. Max Factor, the great name in professional make-up, was also looking for a better solution to the make-up problems posed by Technicolor. In the late 1930s, Max Factor took a different approach to the problem. After more than two years of experimentation, both at Factor and Technicolor, a new make-up, known as the T-D series, was created. Frank Factor was put in charge of the project because his father, Max Factor, was seriously injured in a car accident. The first commercial use of the new makeup took place in a 1937 film. Very successful, it was soon adopted by all studios, relegating the Nuchromatic to oblivion. Arden closed the Stage and Screen division in the late 1930s. According to some authors, the name Pancake" comes from the fact that the product looked like a cake. 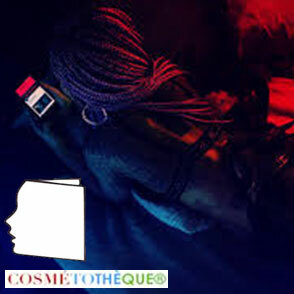 However, given that the makeup that was developed for Technicolor used panchromatic film, it seems likely that"pan" is the shortcut for"panchromatic". Pancake was made from water, containing a strong pigmented filler incorporated in a cream based on triethanolamine stearate, lanolin and water. It was made by adding fillers (e.g. talc) and pigments (e.g. iron oxides) to oils and waxes that had previously been mixed in water with a dispersing agent, TEA soap. After having worked the whole to obtain a homogeneous paste, then dried, it was micronized in a fine powder. Finally, the product was compacted in a cup. In 1936, Max Factor obtained the first of two patents for a new make-up base specifically designed for the Technicolor film. Initially used in the film"Vogues de 1938" (Walter Wanger Productions), it was marketed in 1938 under the name"Pancake" for the general public. It was an incredible success for Max Factor. It was first widely copied before finally defining an entire group of cosmetic products. It then took many years to see remarkable progress. The best known application is probably a titanium oxide doped with iron oxides, also known as Photogenica or Photolight™. Exposure to the light of the pigment causes a change in the valence of the iron oxide which, consequently, changes colour to darken. This process is reversible when exposure is stopped. 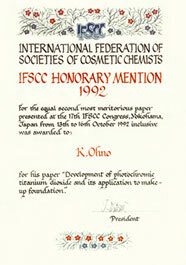 This formulation concept was initially used by Japanese brands, leading Shiseido which was awarded in 1992 (K.Ohno Paper 31, table 2.1- IFSCC Congress 1992) at the IFSCC congress on this theme. Many Western, European and American brands followed. Finally, let us mention the light diffracting pigments. Initially, these are mainly what we call"micatitanes", consisting of a sandwich of layers of metallic elements with different optical properties. At each parting plane, the reflected light path is modified to create specific reflection effects, ranging from total reflection (white with mother-of-pearl effects) to interferential reflections, allowing chromatic effects to be created by light decomposition, prism effect type. These products can be completed with an external layer of absorption pigment combining a reflected colour and a transmitted colour (duochrome effect). These specialities are used to develop shimmering and pearly colours in virtually all categories of make-up products. They have also been used in low doses and very finely ground to generate skin color correction in some anti-aging claim products. In this case, they are called corrective pigments (Chanel 1990). The most sophisticated products, based on silica wafers as matrix, create very attractive multi-interference effects (Xyrallic™, Merck). The object changes color depending on the viewing angle or the relief level. Another approach consists in developing what has been called the"soft focus" effect, then later"blur" or"Blur". This approach consists of using a particular type of pigment with the basic property of diffracting light on the surface of the skin. This leads to a significant decrease in the perception of the skin microrelief by a blur effect, resulting in a smooth appearance. 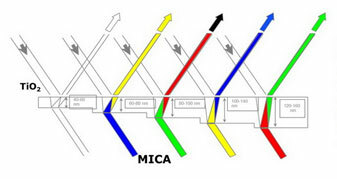 This concept was initially proposed by Japanese teams (Pola in the 1980s - Nakamura and all, paper 23, table 21, 14th IFSCC Congress 1986) and later extended to other pigment varieties. If, at the beginning, pigments were mainly constituted by specific forms, such as silica beads fixed on mica plates, the technology gradually proposed other types of substances such as silica or PMMA beads, boron nitride or, closer to us, with elastomeric silicone powders functioning as light traps. Even more specific approaches have been proposed as a combination of a soft focus filler and a fluorescent substance, complementing the diffraction of a complementary reflection (EP1099437A1). Finally, nanometric pigments are at the base of what is called photonic make-up or"Butterfly make Up", by analogy to the processes of color creation in nature. These pigments are very often nanometric structures very difficult to use for technical reasons (optical interference with traditional ingredients) or regulatory positioning, but they are known. Just like adaptive photo pigments like spiropyrans, but which are not listed in the regulatory framework. There are very few examples where white or other light is used to modify or activate cosmetic substances. Beyond applications in the medical field, such as dynamic phototherapy (PDT) or Puvatherapy, there are only very limited uses in cosmetics. In the two cases mentioned above, we are clearly in medical applications. In PDT, a technique born in the early 20th century (1904), the principle consists in applying a substance that is activated with light. The molecule then becomes cytotoxic and destroys sensitive cells. Among the candidate molecules are aminolevulinic acid or more generally methyl aminolevulinate. This substance penetrates the cells and sensitizes them to light. The lesions are then illuminated with a specific light (red at 630 nm), which leads to the elimination of the cells concerned. No cosmetic application is known, at most procedures to correct skin cancers associated with the sun. PUVA therapy is an effective photo chemotherapy in certain skin diseases, of which psoriasis is one of the main indications. It combines a drug, psoralen, and an ultraviolet illuminant. The psoralen, under the effect of light, forms bypasses with the DNA strands, which leads the cells to apoptosis and leads to their elimination. There has been a well known attempt to use this principle to improve melanin formation by sensitizing the skin to UV rays. This is the famous episode of Bergasol™, a sunscreen product that can cause a faster tan. But it ended in a ban. The peptides currently proposed in this field are not sensitive to light. If we are specifically interested in cosmetic applications, we will first of all retain, in the dental field, the teeth whitening devices that have existed. Starting with sodium bicarbonate, but especially by passing through a peroxide (hydrogen peroxide, carbamate or urea) which produces hydrogen peroxide under the effect of white light, one can hope for a relative whitening of the teeth. At home, it is mainly peroxide solutions applied through specific channels that exist, with few light devices. A practice in specialized salons, called"tooth bars", with the help of adapted apparatus, existed in a fleeting manner. In the field of anti-ageing, the most successful work was carried out by a manufacturer, Sederma, which proposed a combination of active ingredients, each potentiated by the effect of white light. This combination of Darutoside (a pure healing plant molecule extracted from Siegesbeckia orientalis) and a matrikine (lipopeptide stimulating the production of proteins and matrix constituents such as collagen, elastin, hyaluronic acid) was used by Filorga in its device Lumithérapist™. Finally, there is the often described biocidal effect of blue light. Its indications are skin imperfections, such as pimples or efflorescence, associated with bacterial development. There are several devices specifically positioned in this segment. But in this case, it is the direct effect of wavelength that is at issue, not the activation of a substance.